In order to fulfill the requirements of customers and suppliers, state authorities and other interested parties, our company developed and implemented an integrated system that includes the Quality Management System, the Environmental Management System and the Occupational Health and Safety Management System. 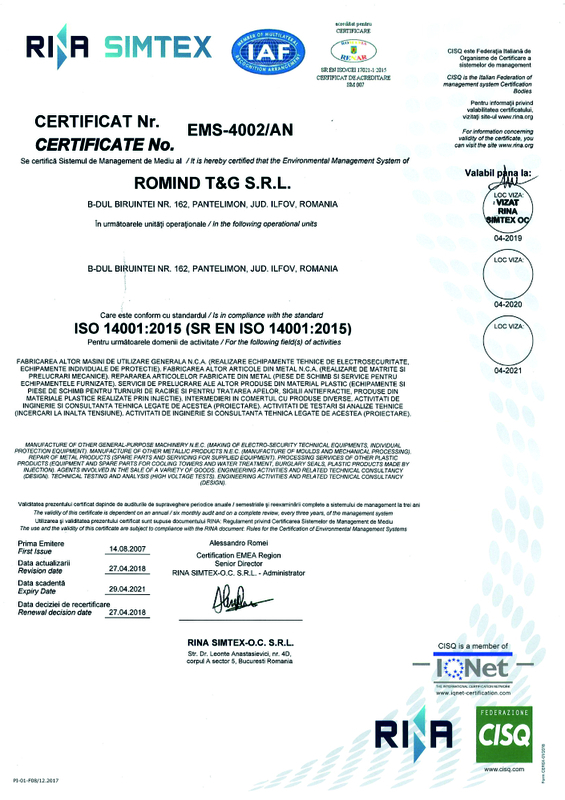 Starting with 2005, all these management systems have been homologated by the Certification Body RINA SIMTEX and are permanently supervised by annual audits and constantly improved in order to conform with the standards in force. 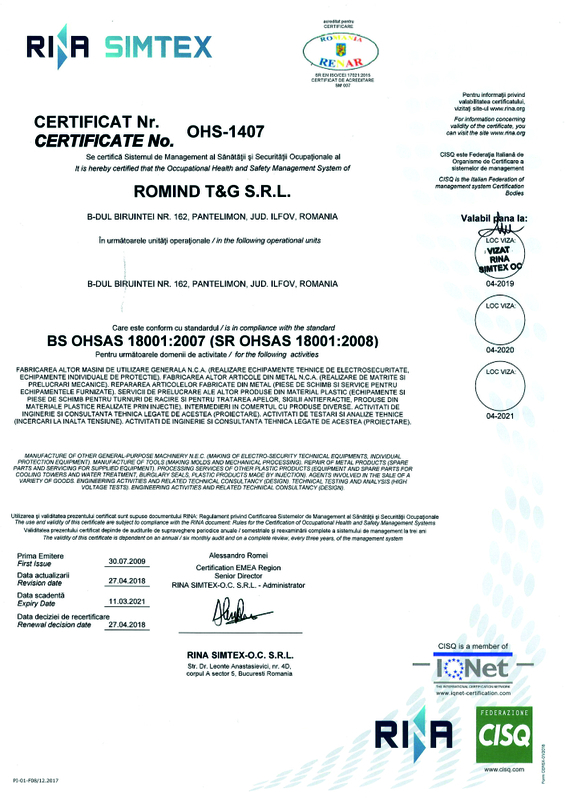 Moreover, the company management has been concerned to obtain for the manufactured products for work safety Conformity Certificates issued by specific Certification Bodies. 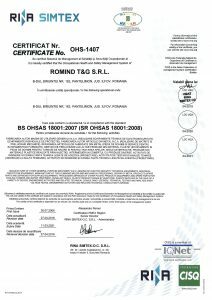 Having obtained these certificates, the symbols or can be found on Romind T&G products, symbol that guarantees clients that before being launched on the market, the product has been designed, tested and certified so it complies with the standards in force. 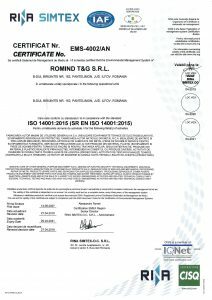 Also in the work safety area, we introduced in the market products having conformity certificates according European Markets, all these products having the conformity marking . Additionally, for these types of products, there were obtained and maintained marketing authorizations, agreements or technical approvals of the companies from the power transport and distribution (Electrica, , Transelectrica). In order to offer our clients electric test reports for the products, we invested in building and accrediting a High Voltage Testing Laboratory. Starting September 2008, our Testing Laboratory functions according the specifications of standard, Laboratory accredited by the National Certification Body - Renar. 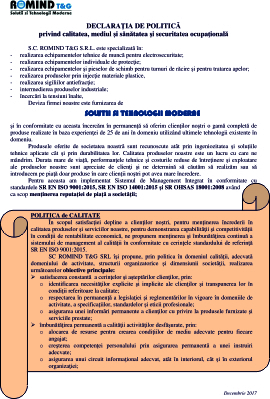 - Agreements for cooling tower equipment. A similar concern we have regarding the homologation of the Technical Agreements for Early Streamer Emission lightning systems imported from France and widely commercialized on the Romanian market. In order to meet and exceed the requirements of our major clients, we have tested and homologated in terms of operational safety the steel wire meter seals. The technical performances of our meter seals have always been improved in order to ensure a higher degree of safety in use, seal used currently by major electricity distribution companies (Enel, Electrica, CEZ) or gas companies (Distrigaz Sud), along with railway transport companies. 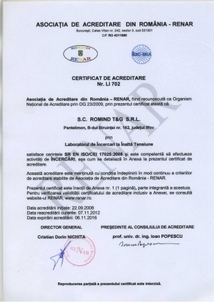 - holds the license to apply the green dot on products packaging. Romind T & G also implemented a program to prevent and reduce the amount of waste generated from its own activity.